The base version of the software is MecaWind, and it offers the most cost effective option of performing wind calculations. MecaWind Pro offers the same calculations, with the added benefit of being able to graphically see all Main Wind Force Resisting System (MWFRS) pressures on each surface. Seeing the pressures graphically gives the user a real advantage at being able to visualize what is physically occuring. Figure 3 shows a typical MWFRS graphic. The user can turn on/off different surfaces, change colors or rotate and manipulate the graphic just as you could in any 3D modeling package. In addition you can toggle between Wind Direction, +/- Internal Building Pressures and Minimum wind pressures with ease. You may then make a one (1) page report of this MWFRS Graphic with the click of a button. Click here to see a typical one (1) page MWFRS report. 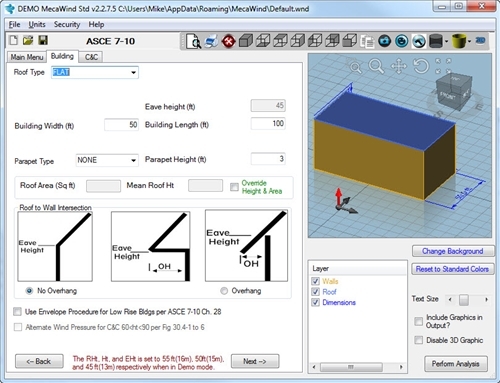 MecaWind Pro also offers the ability to calculate the total reactions at the base of the structure. This is no simple calculation, given the complexity of the pressure distributions on the roof. MecaWind Pro takes all pressures into account, and gives a simple summary of the base reactions.